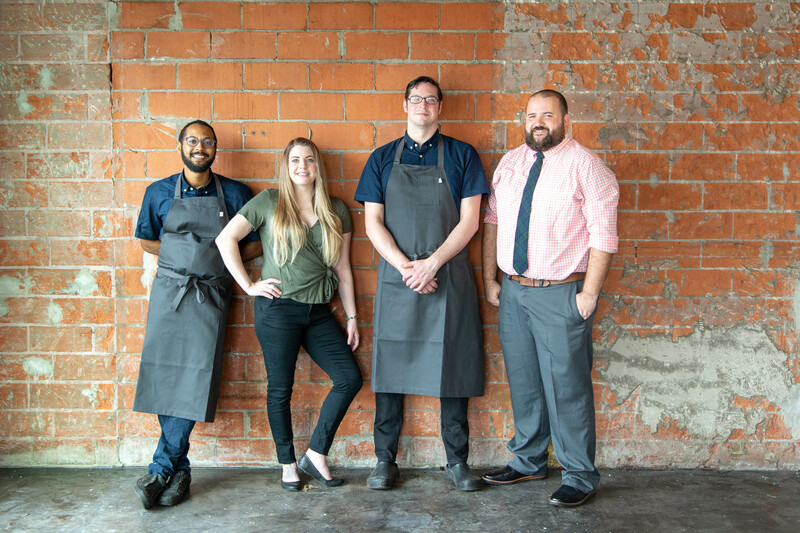 Squable's opening team: from left to right, co-chef Mark Clayton, bar manager Anna Wilkins, co-chef Drew Gimma and general manager Terry Williams.Photo by Jenn Duncan. After months of breathless media speculation, Bobby Heugel, James Beard Award-winning chef Justin Yu and Steve Flippo, partners in Better Luck Tomorrow, have released official details on Squable, the new restaurant going into the former Southern Goods space. (Yes, it’s “Squable” with one “b,” not two, which refers not only to frivolous disagreements but is also a silly mashup of “squab” and “squabble.” ) The restaurant opens in The Heights sometime this spring and is serving “European fare with American influences.” The planned dishes also make use of Texas ingredients sourced from Blackwood Educational Land Institute, Tejas Heritage Farm and local fishermen. Through Anvil Bar & Refuge, The Pastry War and others, Heugel established himself as a pioneer of the modern cocktail movement in Houston. Yu, for his part, is equally visible as a forerunning chef, having won his Beard award while running Oxheart (now Theodore Rex). Both, however, want to make clear that they aren’t “running” Squable. Instead, longtime former employees and business associates Mark Clayton, Drew Gimma and Terry Williams are the partners overseeing the goings-on. Squable chef/partner Clayton, who’s also worked at Stella in New Orleans, first caught the eye of the Houston dining scene as one of Randy Rucker’s chefs at long-gone but significant Bootsie’s before taking a sous chef role at Oxheart. (In fact, he’s the only one to ever hold that title there.) Gimma, also a chef and partner, gained experience at Sullivan St. Bakery and Per Se, then moved to Houston to be Common Bond’s first head baker. Justin Vann, beverage director of Theodore Rex and co-owner of Public Services Wine & Whisky, is curating Squable’s wine program — and it’s expected to be an exceedingly important aspect of the restaurant concept. 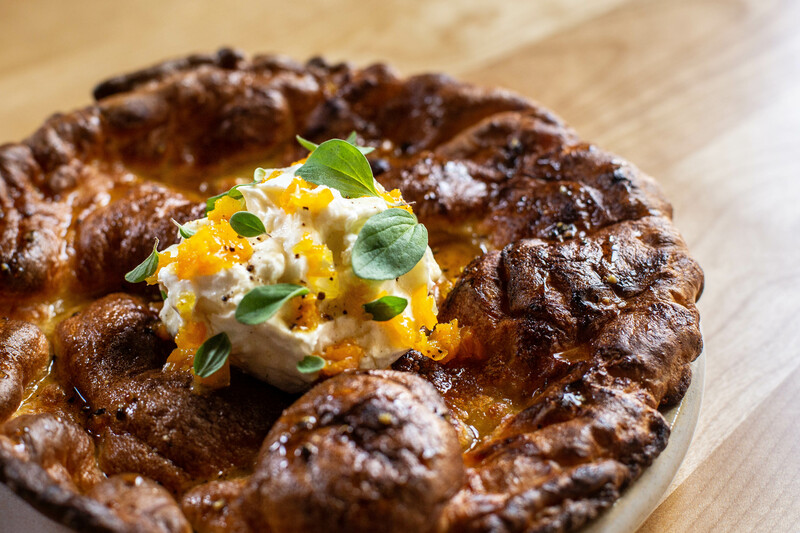 Squable chef/partner Drew Gimma’s Dutch Baby is one of the dishes intended to showcase often-overlooked bread dishes. Photo by Jenn Duncan. Williams, who is Squable’s general manager and partner, worked his way up through the ranks at Heugel’s bars. He was promoted from bartender at Anvil to general manager, then to operations director for both Anvil and Better Luck Tomorrow. He’ll continue in his current role at the latter but says that his involvement at Anvil is tapering down as general manager Tommy Ho takes the lead there. Squable chef/partner Mark Clayton created a Smoked Grouper dish for Squable’s initial menu. Photo by Jenn Duncan. “We enjoy wine with our food and we see that as a much larger focus at Squable [than at Better Luck Tomorrow],” said Williams. That aside, Squable’s press release promises “some of the best martinis in the city” as well as cocktail staples. So, Better Luck Tomorrow’s Anna Wilkins is moving to the new bar manager role while Qwesha Byrd steps into Wilkins’ former position. Rather than doing a complete overhaul of the old Southern Goods space, which Williams says “already has fantastic bones,” the partners are letting the food and wine program be the main distinguishers of Squable’s intended identity as a comfortable but unique neighborhood restaurant. The modest changes include new tables outfitted with silverware drawers (similar to Theodore Rex) and installing the same kind of brass bar top that Better Luck Tomorrow and Anvil already sport. When asked how Squable is going to have an identity distinguishable from other Houston restaurants, Williams says, “We want it to be just as accessible for our neighbors in The Heights as it would be to anyone looking for thoughtful food.” Some of that thoughtful food includes leveraging Gimma’s baking experience. Unlike many restaurants, Squable is making bread a centerpiece rather than an afterthought. In addition to rotating seasonal breads, the menu features a Dutch Baby Pancake with fresh cheese, black pepper, and honey as well as a dessert bread of Caramelized Pain Di Mie with maple and cream. Clayton’s entrées range from flavorful pasta dishes — such as handmade pasta bathed in butter-braised onions and sheep’s milk cheese and Pork Neck Schnitzel — to meaty offerings like Smoked Grouper with pumpkin seeds, herbs, and fried garlic and Tagliata Steak with Texas olive oil and arugula. 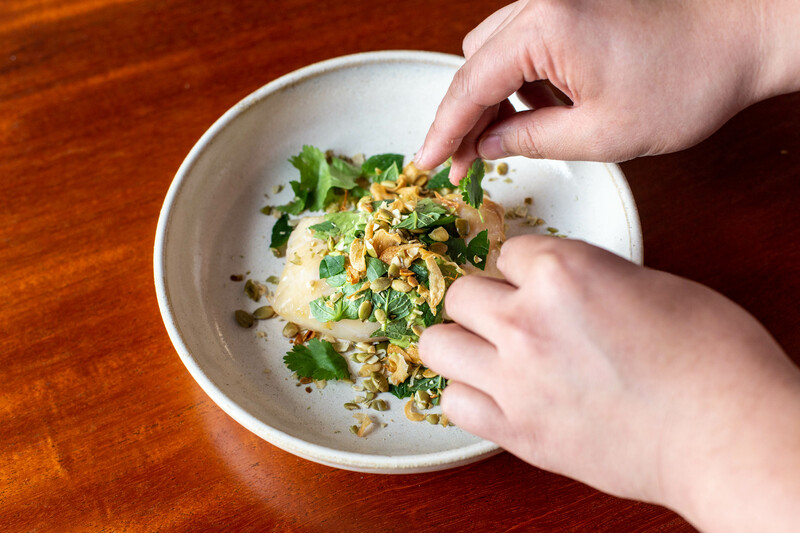 As is the trend, Squable is also offering an assortment of savory small plates, which allows customers to try a wide range of food in ways that doesn’t break their budgets. Such options include Potatoes Anna made into french fries with herb mayonnaise and Stracciatella Cheese with olive oil and herbs. Squable is going to be open for dinner initially and a brunch is being added after it settles in post-opening. To keep up with its progress, follow it on Instagram and Facebook.